Ah! Finally a Brooklyn park with great food selections! Visitors to Brooklyn's park jewel, Brooklyn Bridge Park, located near DUMBO and Brooklyn Heights, can feast on artisanal pizza, lobster rolls, ice cream, and, not to mention beer, wine and cocktails. Or you can take the DIY approach and use one of the many grills in the park and have a BBQ. It's the perfect foodie destination for people biking across the Brooklyn Bridge or cycling around Brooklyn who want a quick snack without stopping. 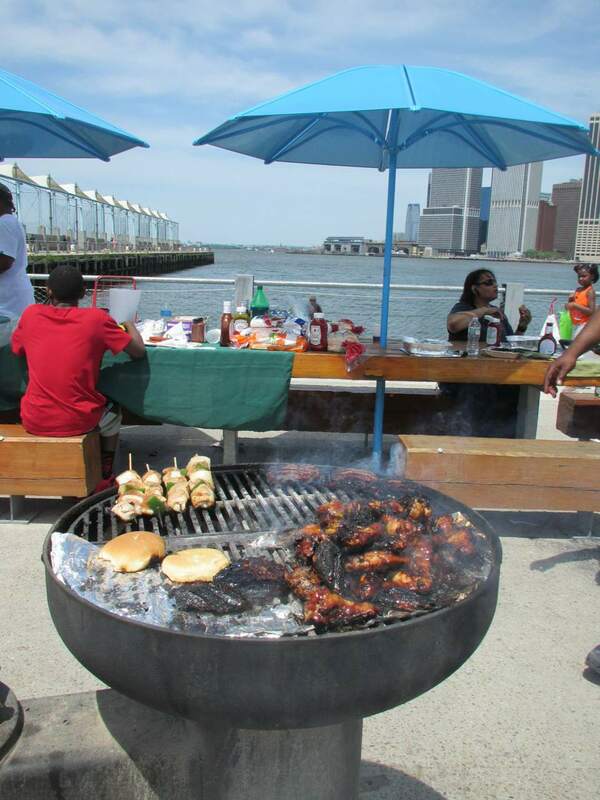 Brooklyn Bridge Park: Gastronomically Speaking, the Best Park in Brooklyn. Enjoy artisanal pizza at Fornino while soaking in the sun and the views from their rooftop eatery. Located next to Pier 6, this restaurant also boasts an incredible list of tasty cocktails. You don't have to travel to New England to get a fresh lobster or an award winning lobster roll, simply get a table at Luke's Lobster housed in the historic Smokestack Building. This foodie favorite has locations in Maine, Miami, and many other places throughout the country. The Brooklyn Bridge Shack has a menu of seafood classics including shrimp rolls, crab rolls, and clam chowder. Eat oysters and have cocktails on a historic schooner docked at Pier 6. Pilot has a menu of seafood favorites including Lobster Rolls, Soft-shell Crab Po'boys, and for those with kids in tow, Pilot has a kid's menu. Make sure you leave room for dessert! Ample Hills Ice Cream has a kiosk at Pier 5. Don't fret if there's a long line, it's worth the wait. If you haven't gotten your fill of ice cream, you can always head to the Brooklyn Ice Cream Factory located in an old Fireboat house at Fulton Ferry Landing.